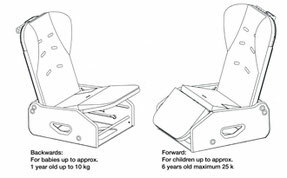 The SkyKids® child seat complies with the transport regulations for children in the same way the aviation authorities require for adults, whereby a baby must be secured opposite the flight direction (up to 10 kg) and larger children must face the flight direction (up to 25 kg). It is constructed so that it can be converted from a baby seat for the very smallest child into a child seat for toddlers up to 6 years old with a simple folding mechanism. The variable SkyKids® child seat is equipped with a 5-point belt that can be adjusted precisely to the size of the child.